This is not a teacher post. This is an internet junkie post, which I’m guessing you are at least in part, if you’re reading this. 1. 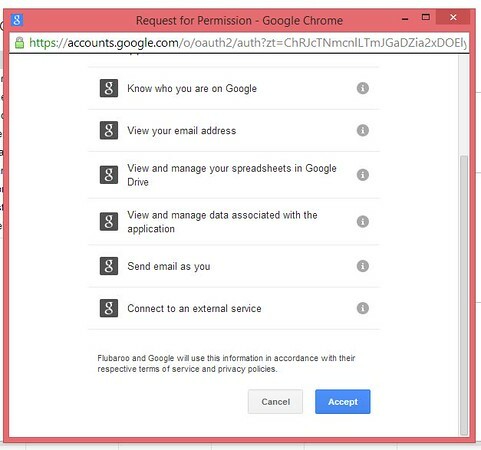 With Chrome you can sign in with your Google account, meaning your shortcuts, menu bar, history, tabs, etc. are there no matter which computer you sign in on. Also, if you commit fully to Google, which is a good idea since they are taking over the world, you can also log into your email (Gmail), calendar, and Drive (cloud) in one fell swoop. No matter where you are, no matter which computer, as long as you’re signed into Chrome, it will look exactly the same. Cool. 2. 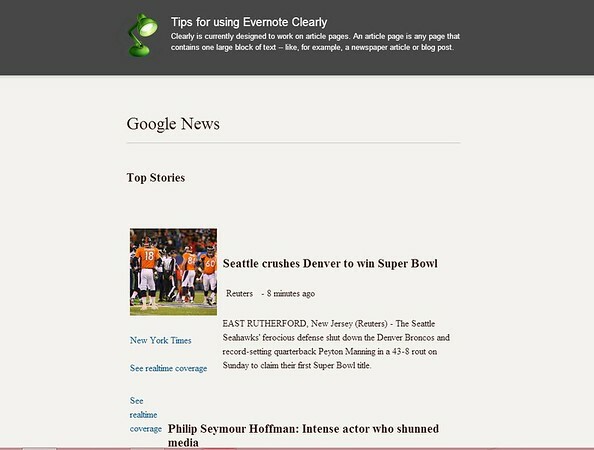 Extensions and apps are browser based, meaning those travel with you in your Google account and are not local-computer based. 3. 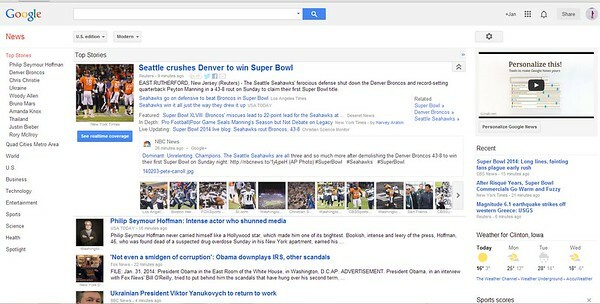 No search box–search using the address bar (this is called the Omnibox). 4. If one of the tabs freezes, the others still work. You don’t have to close out the whole browser. 5. You can have a custom home page (or set of tabs). 6. It’s fast and rarely has problems loading web pages. 7. There are TONS of great apps and extensions! I will talk about great apps another day. Today, I want to talk about Chrome extensions. I know that Firefox has great extensions, too. I’m not sure about Explorer. 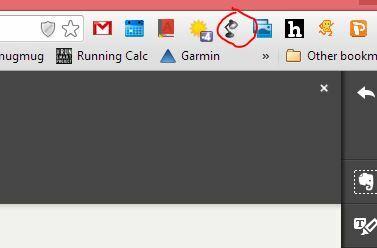 I haven’t used Explorer since…the stone ages. 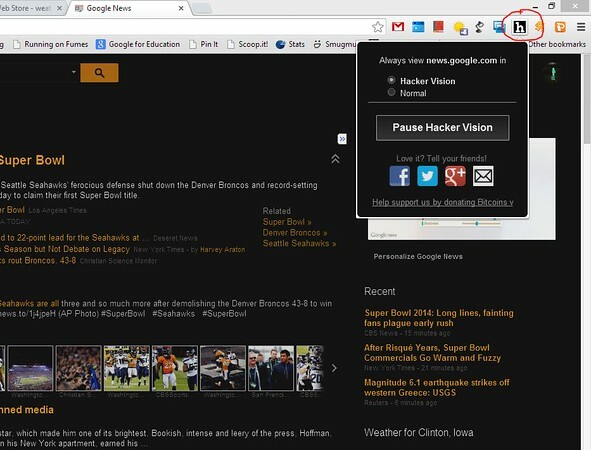 Extensions are little programs that live in your internet browser and make it more awesome. They are not dependent on which site you’re on–they act as a part of your browser. 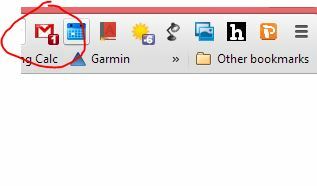 Once installed, some extensions have little icon shortcuts to the right of the address bar (omnibox) but others don’t show up unless you need them. You can manage (enable, options, and/or delete) extensions in the settings menu under “extensions”. 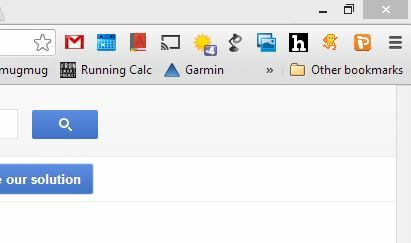 To get to settings in Chrome, click the three horizontal lines at the top-right of the browser window. Here are some fun Chrome extensions that I love. All can be found at the Chrome Web Store. The Chrome Web Store has Apps, Extensions, and Themes. To search only for extensions, click “extensions” to the left when you’re in the store. 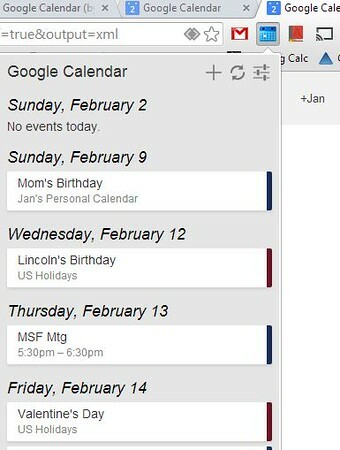 Google Calendar – this extension allows you to quickly click and see upcoming events on your calendar. My schedule is really light this week–woohoo! 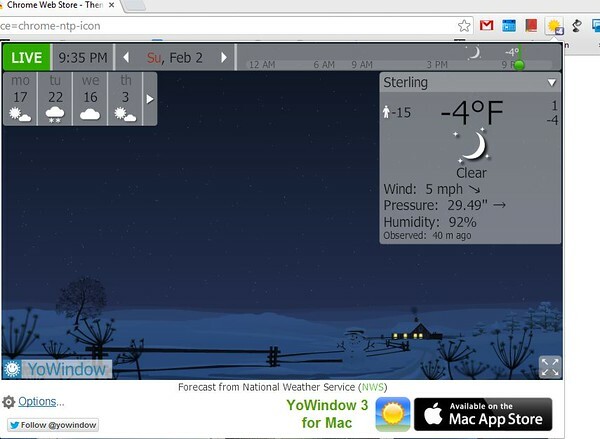 YoWindow – There are a lot of weather extensions, but I decided to try YoWindow because it had the highest ratings and most users in the Chrome Web Store. It is pretty fun–it has a little scene to represent the weather. Note our weather. Brrrr. It was a “booger freeze” run today. You know what I mean right? Hacker Vision – makes the background black and the text white, which is supposed to help eye strain. 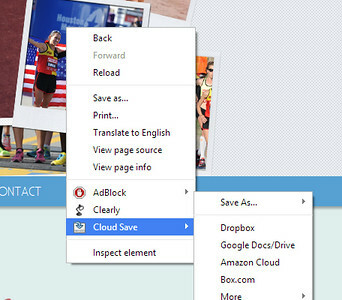 CloudSave – When you right-click an image, you have the option to save directly to some online places like Drive, Dropbox, Flickr, etc. Google Mail – Installing this extension gives you a little icon in the extension area. If you have mail, a little number shows up. This way, you don’t have to keep your mail open all the time. 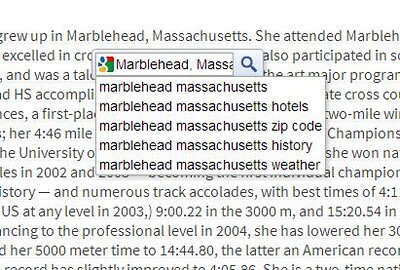 Highlight to Search – When this extension is installed, you can highlight text and a little search box comes up, allowing you to search for it. There are hundreds and hundreds more…these are just a few I’ve experimented with lately! Are you a Chrome user? If not, are you going to try it? What are your favorite extensions? Earlier, I explained in [too much??] 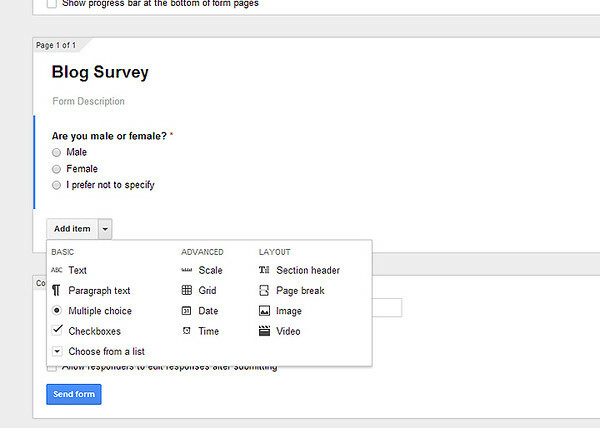 detail how to create a Google form (click that sentence to view). Now, let’s talk about an awesome Google script: Flubaroo. Using this script, you can automatically grade your Google forms quizzes and email results to participants. I created a quick little quiz here: Busy Prepositions and the results sheet is here: Busy Prepositions Responses. Just to show off, I created a quiz with an embedded YouTube video. Once you’ve created a quiz, take the quiz twice. One time, create an answer key by entering “correct answers” or “perfect” as the name (or something else to help you remember) and then complete the quiz answering all questions correctly. The other time, it doesn’t matter. You need to take it twice because Flubaroo requires at least two responses. Once your students have taken the quiz, it’s time for GRADING! On the answer spreadsheet, go to the “tools” menu and select “script gallery”. Search for “flubaroo”. Then, click “install” next to Flubaroo. It will ask you for permission to do a few things. Unfortunately “mail my dad a birthday card” is not on that list. Click “accept”. Looky, now you have a new menu on your sheet! 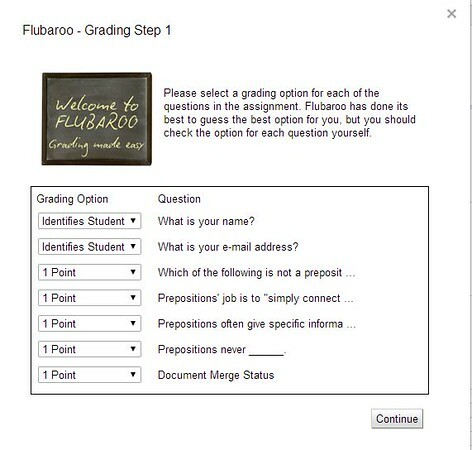 Go to the new Flubaroo menu and click “grade assignment”. Step 1 is where you identify what to grade and how many points each question is worth. You can also skip grading specific questions if you wish. In step 2, you will choose the answer key. Make sure your key is correct for obvious reasons. Boom! Quiz graded! Wipe the sweat off your brow. You will now see two tabs on your sheet (at the bottom). 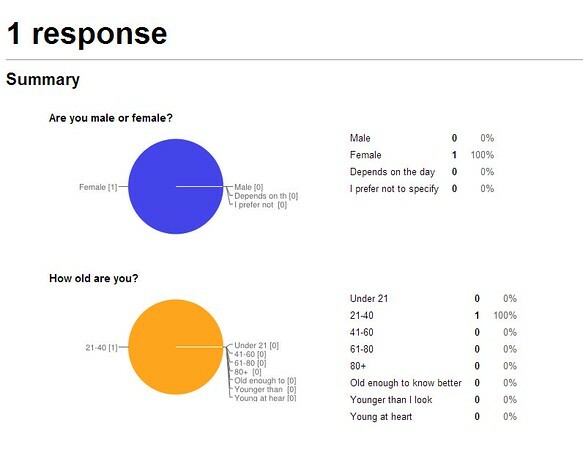 You will also see a summary of your responses at the top, and questions in which the overall score is less than 60% are highlighted in orange. Now of course your students will want to know their scores. No problem! 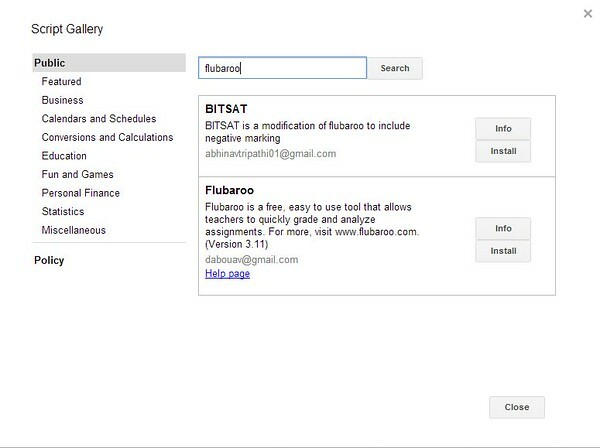 Flubaroo will automatically email them upon request, as long as you have created an “email address” question and the students have entered a valid e-mail address. 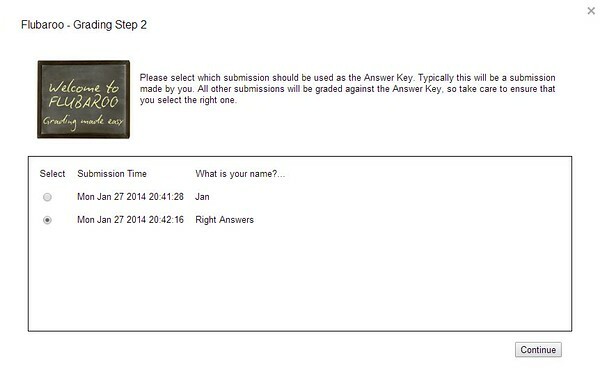 For my email “question”, I did use a data validation option which will hopefully help solve some email entry errors. 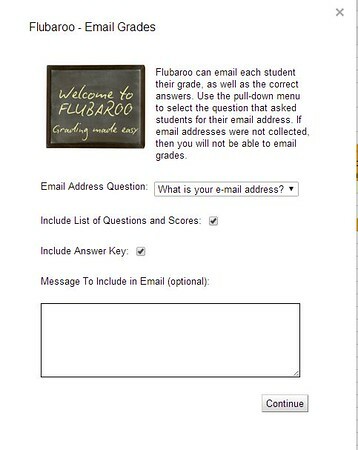 Go to the Flubaroo menu again and select “email grades”. Choose the email “question” and decide what you want the e-mail to include. 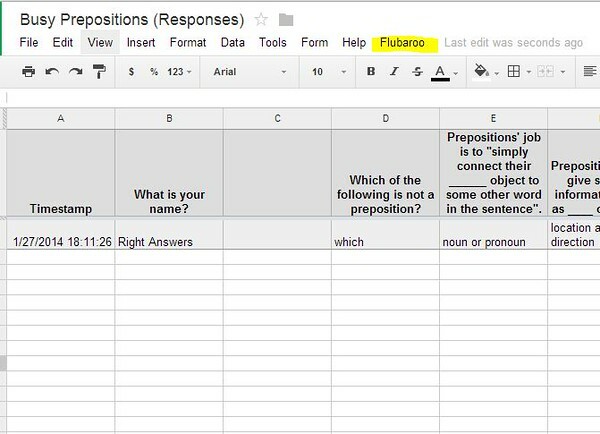 There are a few more Flubaroo tips here, like on how to have multiple text answers: Flubaroo! 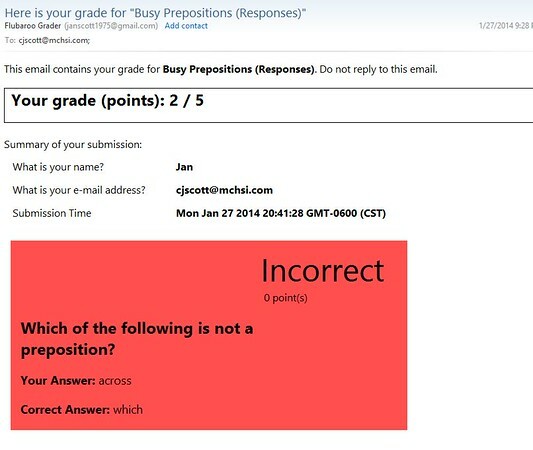 Wouldn’t it be cool if the quiz would automatically e-mail the student upon submission? Guess what, it will, using a script called Autocrat. The reason I don’t use ONLY Autocrat is because I cannot figure out how to have Autocrat send the actual grade…you have to use Flubaroo to manually start the grading script first. However, at least my students will receive an e-mail response with their answers (and the correct answers if I chose). I will post on Autocrat soon! 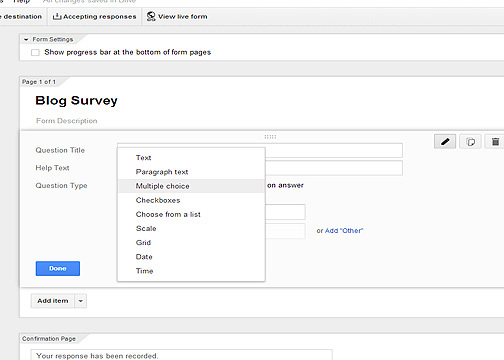 Google Forms for Surveys, Data Collection, Quizzes, and More! 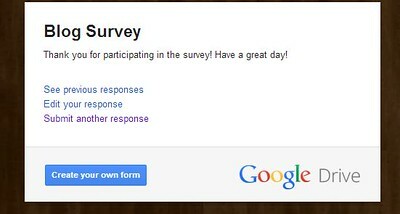 Have you ever used Google Forms? I made a very quick sample form that is also a survey of my blog readers: Please Complete This Reader Survey! 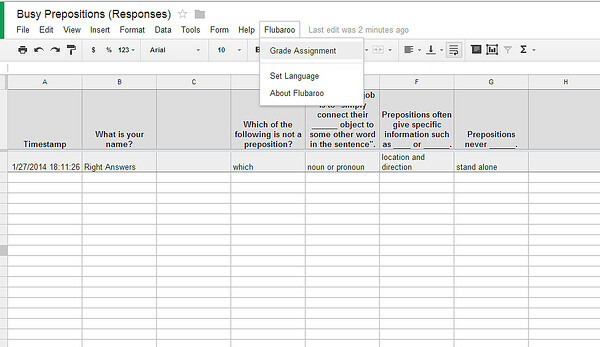 This is not a teacher thing–Google Forms can be used for a lot of things! 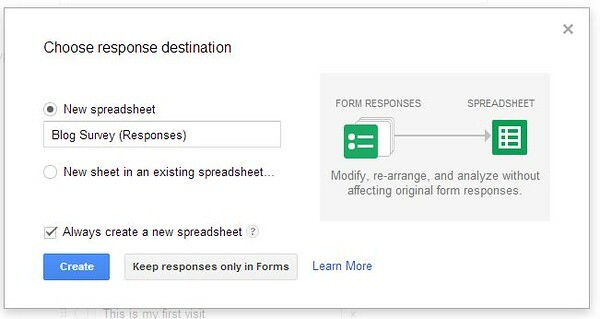 Google Forms are essentially questions with answers recorded on Google spreadsheets. 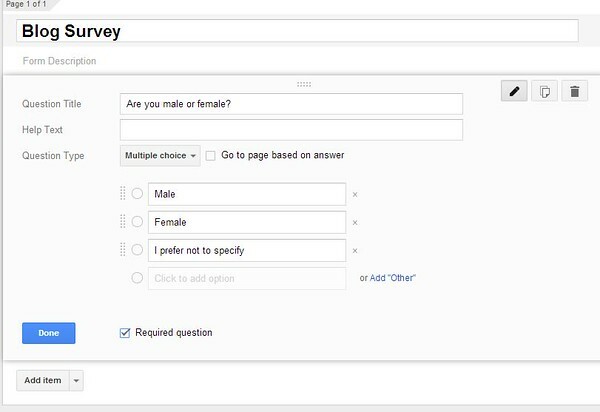 Unlike other survey websites out there, with Google Forms you have complete control over your form and your data. 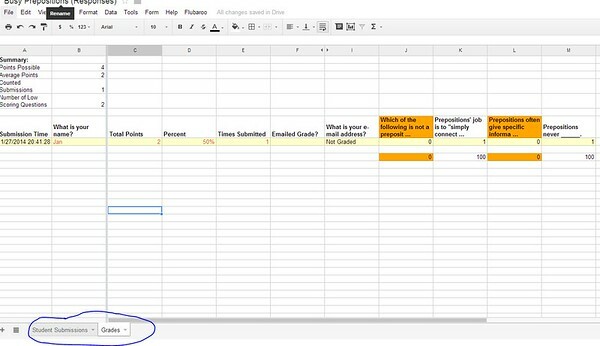 Google forms can be used any time you want to collect data. 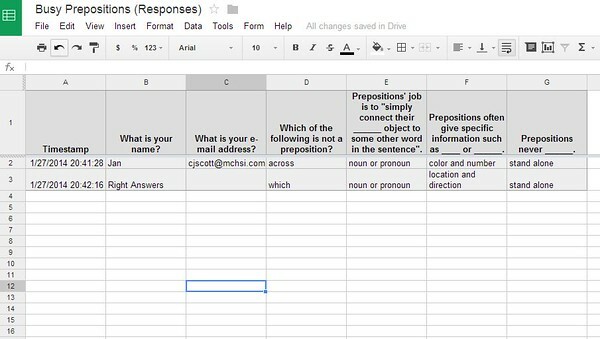 There are a lot of great ideas here: Innovative Ideas for Using Google Forms and here: Integrating Google Tools 4 Teachers. Let’s walk through making a simple Google form. 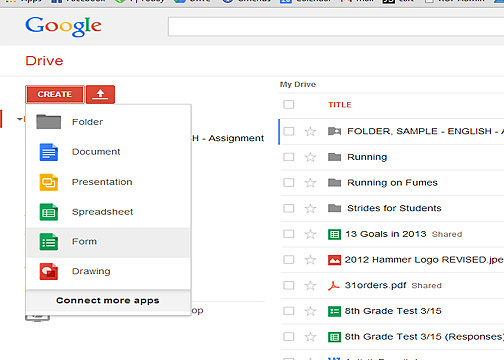 To start off, you must have a Google account and be in your Google Drive. Then, click “create” and select “form”. Then, you will choose a title and a theme. Choose which type of question you want. Type in your first question and the choices. Click “add” to add another item. Note that you can also add images and videos (You Tube only I think). 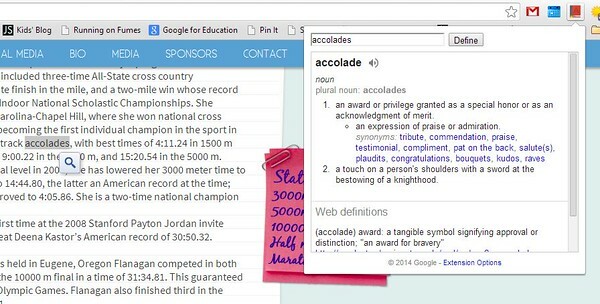 You could create really cool webquest style activities. I add a page break every few questions so my users don’t have to scroll too far down one page. When you are finished adding questions, do the confirmation page (last item by default). 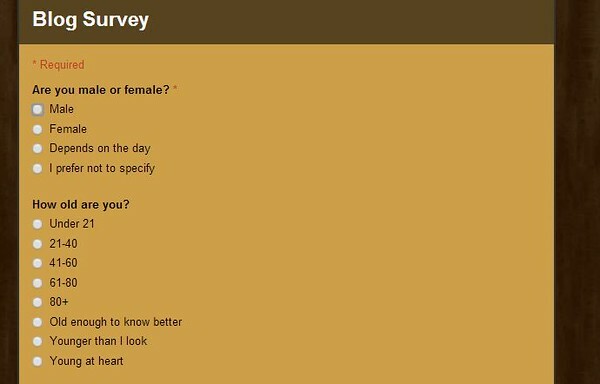 Note that you can choose if you want your participants to be able to see the results of the survey and if you want them to be able to edit their responses. In the classroom, I usually do not allow them to see others’ responses, but it kind of depends on what you’re doing. You can toggle whether or not you’re accepting responses (red) or view your survey (blue). 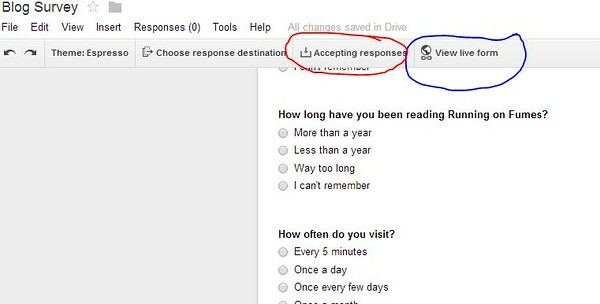 By going to the response menu (see above photo), you can determine where the results of the survey go. They will end up in a Google spreadsheet. 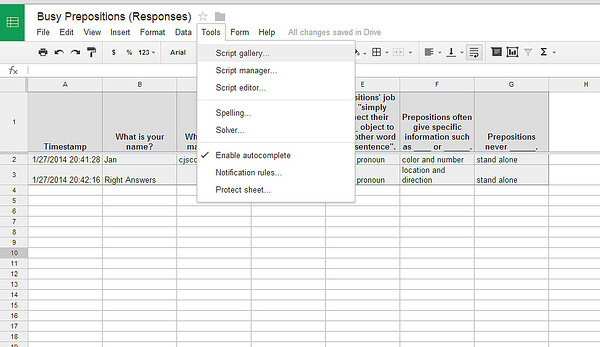 In my Google Drive, I can see my form and my response spreadsheet. Click “view live form” and test out your survey! Here is what my results spreadsheet looks like. I can manipulate this information just like I can with any other spreadsheet. 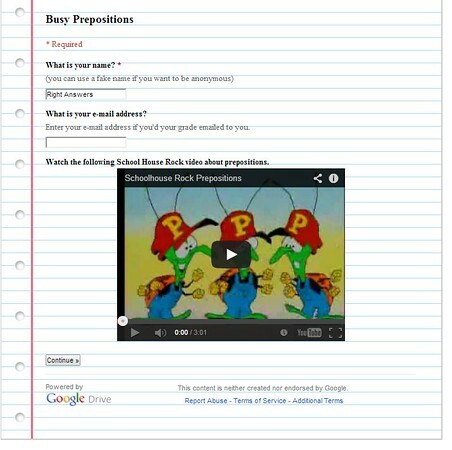 At work, because we have Google Apps for Educators, I can require that my students use their Google account to sign in. Alternately, you can make Question 1 “name” so you can keep track of who’s who. 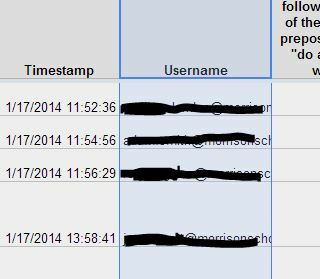 Then, on my results spreadsheet, I get a username along with a time stamp. 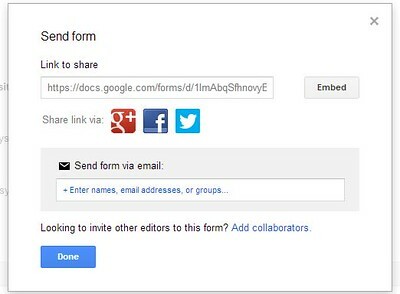 If you click “send form” at the bottom of your form, you can share with others in a variety of ways. 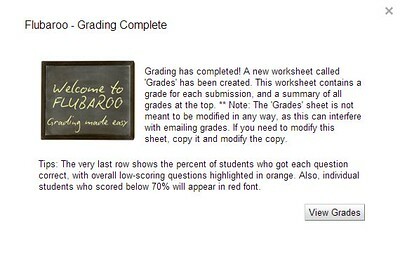 Now you can read about how to automatically grade these quizzes and send the results to your students using Flubaroo here: Autograde Quizzes with Flubaroo! 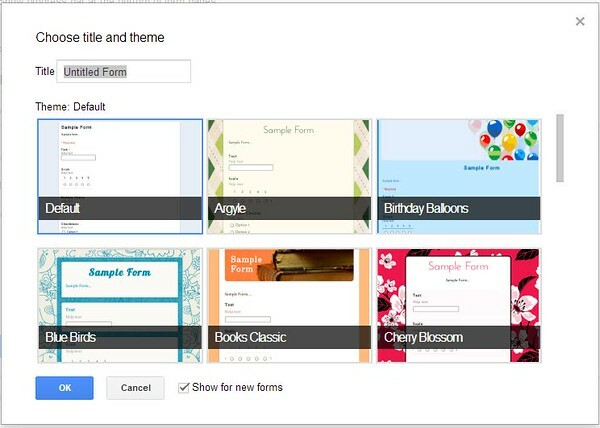 Do you use Google forms? For what? If not, what do you think you could use a form for?